Awesome Private Pool Cabin with Mountain views and Seclusion! VIEW NOW. We had a fantastic time. Cabin was cozy and inviting. Enjoyed the fireplace. This was my first time vacationing in this area. I was very pleased with my stay. The cabin was clean, neat, and cozy! When we checked in the staff was extremely nice; we even received a courtesy call the next day to make sure everything was okay. Very pleased, and look forward to coming back. It is a beautiful cabin. They thought of everything and it was very clean. We would absolutely do it again. Everything was great I have already directed several of my friends, one of which will be staying with you guys at a 3 br location this wk. Mr James Davis and family. It was a very nice cabin. we liked the design, arthitechture and amenities. better than in the pictures. loved the pool table, jacuzzis. However the TVs did not work properly. Remote batteries were drained. Netflix did not work at all on either of the TVs. That was a big disappointment to my son. also the Door lock needs to be sturdy. once we came back and found the front door ajar. although i checked twice before leaving that the door is locked properly. Friendly staff, clean and well-maintained cabin, easy to locate and an awesome overall experience. My husband and I enjoyed it so much that we are returning this weekend! Staff was excellent thru booking and arrival. 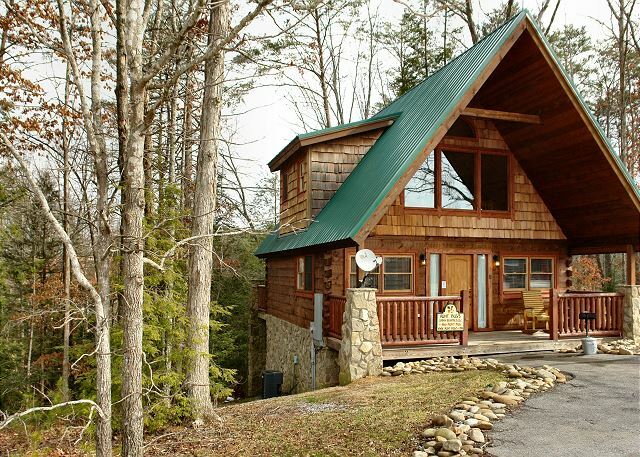 Hidden Romance 1404 is a private and cozy cabin. I would recommend this cabin for younger than 70 year old people due to the bedroom being in the loft. First three or four steps do not have a handrail, I was a little concerned coming down to the main floor. Very clean and I highly recommend this for consideration. Aunt Bugs is awesome! Thank you for being so kind and making it easy to book our stay. The cabin was very well kept. One small recommendation, upgrade the entertainment system in the cabin. While we do not go to the mountains to watch TV it is a confusing setup and was difficult to watch in downtime in the evening. I think there were five remotes for the two setups upstairs and downstairs. Overall I would give it a 9 and half.. love the Aunt Bugs team checking in.. very welcoming. This is the second time we've stayed with Aunt Bugs and it is always a laid back stay with an easy check in/out process. Staff are very accommodating they even called to ensure we would make the check in deadline! Very clean cabin. Good comfortable bed. We had a great time staying at Aunt Bugs . The cabin was great. It was in a great location, close to many attractions but far enough away to feel that country feeling. We could see a mountain from our front yard. The Cabin was clean, neat, and cozy. The only problem we had was with the TVs. Hard to get them to pick up a channel and then the signal would be lost when the channel was changed. But, overall, it was very nice and quiet. Would stay again. Had a good time in the Smokies! We had everything we needed and the hot tub was great to relax in after a long day out in the Smokies. Great location and staff was helpful and friendly. I would recommend downloading the app, very helpful. Definatly will be back. It was very pretty and clean. It was relaxing and not far from anything you wanted to do. Very nice cabin and enjoyed staying there for the whole week. First cabin rental for us from Aunt Bugs but it will not be the last. The house was beautiful, we love the way it was decorated the scenery was breathtaking had a change reconnect with each other,relaxing it was so peaceful we truly enjoy ourself. Relaxing. As another reviewer said, the pictures on the website need to be changed. Half of them are for the cabin next door. The cabin was very nice and very clean. The name of the cabin was not the right name for this place. "Hidden Romance" was expected to be more secluded than what it is. Other than that everything was great and we would stay again. The staff were helpful and professional. The cabin was in great shape. we had all the conveniences we needed. The cabin was conveniently located and easy to get to from all directions. We had a blast. Overall this was a pleasant visit. Close to everything yet far enough to be secluded. Employees very polite and professional. Cabin very neat and clean. Everything was as advertised and more. My wife and I enjoyed this vacation very much. Thumbs up to the staff at Aunt Bugs. The cabin was clean and relaxing. I enjoyed my stay at the hidden romance cabin. It was overall clean, great location.We were satisfy with the quality of the furniture. Overall this was an awesome retreat. The first night there were wasps in the cabin but after killing them we didn't see any more during our stay. Only petty complaints outside of that. Pillows on the bed were really, really flat. Overall it was an awesome experience. Overall we enjoyed our stay at the Hidden Romance Property. The upstairs was like a suite and the layout of the floor plan was good. The bed was a little more firm than we like but overall we enjoyed our stay. Pet friendly, Quiet, Excellent trip. Perfect location wooded property in the back off the deck quiet for relaxation. Cabin was very neat and clean. The location for us was great. Not too far from town. The only fault was we do a little cooking and the had no knifes for cutting. Only steak knifes. The other thing was no sport channels. Really need espn. Otherwise, very nice. Would come back. We had such a lovely time! We were just pleased with everything! We plan to do it again! We enjoyed the cabin, it was a beautiful cabin really enjoyed our stay.We would recommend this cabin too anyone. Hidden Romance was a great cabin to rent for a getaway. Literally 7 minutes to the Pigeon Forge strip. Private and comfortable living conditions. Cabin was very clean. Best Valentines Day i have ever had. 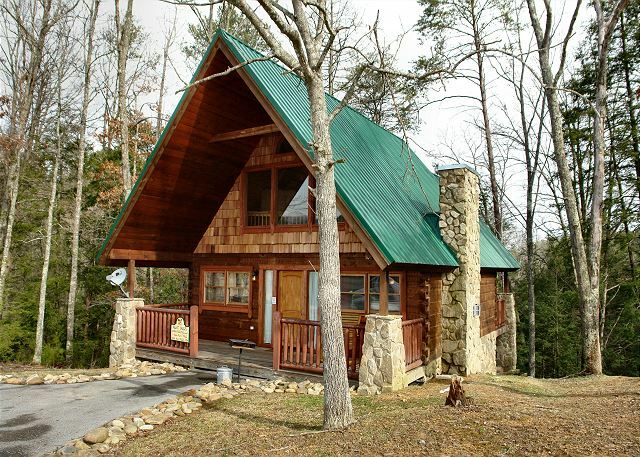 This cabin was everthing we wanted and more.Very clean,and a very short drive to pigeon forge.Had a great time! Loved the cabin! No issues what so ever. Everything was clean and organized when we arrived. The cabin is beautiful and very well taken care of. It was very clean and comfortable. We will definitley plan on renting from Aunt Bug's in the future. Overall a great stay! Loved the cabin even though the pics we seen were to the cabin next door. The loft bedroom was VERY exposed. Need tint on the windows for privacy. Everything was very clean and smelled nice, that is always important. We absolutely loved this little cabin and would rent from Aunt Bug's again !!! The cabin was in a beautiful location and away from all the touristy stuff. Everything was great from start to finish from the time we booked until the day we left. Always enjoy our cabins and service that why we return. Nice quiet relaxing cabin in the mountains Great sleeping and very peaceful. Our cabin was great. It was in a good location not too far from town but very peaceful and quiet. Everything was great, except we are college basketball fans and the DISH network subscription shockingly did not include any ESPN channels, so we watched on our phones, once even in the hot tub. Please spend the extra few dollars a month and upgrade the DISH selections to include popular sports channels. You might also replace the downstairs, quite old, TV; with a flat panel LED. Great service, quick and efficient and everything as advertised. Will recommend to my friends and family for sure. I loved our cabin. Everything my husband and I could have wanted. The cabin was clean, spacious, and cozy! It’s a very close drive into Pigeon Forge which was nice. The staff was so nice to us. This is the second time staying at Aunt Bug’s Canins! We loved it. We will continue to make memories with them. Check in was easy and the cabin was available before 4:00 PM. Hidden Romance is a perfect setting for two people and a pet.Front porch faces the sun and the deck with hot tub is in the shade and Very private. East to access from the parkway. First stay in Wears Valley, it is beautiful. We stayed at the Hidden Romance. Was absolutely beautiful. Had all the amenities we needed. Everything was clean organized and beautiful and happy that it was pet friendly. The only issue we encountered was Saturday night we returned home from a late night dinner and was unable to enter our cabin. We tried multiple times using the key pad also we tried using the lock box. Neither would work. We then called the toll free number and local number multiple times. No answer. We had no other option than to call the local police. A few mins later we received a call back. The whole ordeal took over a hour. A maintenance man and woman showed up and he had no master key. He had to break into one of the front windows in order to get access to the cabin. He told us sometimes the batteries die in the key pad. I suggest from now on that the batteries are checked more often and or tenants are given a physical key and that maintenance carries a master key. We enjoyed our stay. The cabin didnt have storage for our clothing and the only closet (downstairs) was junk storage and no hangers so i wasnt pleased that our clothing was basically in the floor. The cabin needs a few minor things, batteries in the remotes, pool table items such as tips and chalk. The couch wasnt comfy at all. The cabin needs spider web cleaning inside. We enjoyed back view but only had 1 rocker. Loved the app. Service was good from Aunt Bugs. This is our second time renting cabins from Aunt Bug's and I have referred many friends to you. I love having all the comforts of home away from home in a beautifully decorated log cabin. Loved our little cabin! Everything was clean and tidy, staff was very accommodating. Will definitely go through Aunt Bug's again! Very nice place and quiet. I wish that we know that there is no closet space and be better prepared. Hair dryer and iron are provided however on your check list you advised to bring them to the cabin. We love the place and would stay there again. Than you. Great experience from finding the perfect cabin for my family to checking out. Thank you! Very nice stay. We were so thankful to have a nice cabin where we could bring our small dog with us. We enjoyed the hot tub every night. We enjoyed cooking on the gas grill on the back deck. Loved the nice shower and the location/privacy of the cabin. Only complaint is that we did see a few roaches in the cabin. Cabin was great.had a really good time there.cabin was clean and layed out well. Super. Have stated at various Cabins through Aunt Bug's. All clean, we'll kept, stocked. You were very helpful with suggestions and helping us to have a great experience in our honeymoon! Overall a great experience at Hidden Romance! I have a few suggestions. Didn't feel very secure with the style of keyless entry used. Coffee pot was in rough shape, was not comfortable using it after looking at the basket. Not a really big deal but the TV sets could use some work (really old one downstairs and remote control didn't work for one upstairs). Again, overall very pleased! Thanks! The cabin was especially lovely and renting from Aunt Bug's was a pleasure. Very relaxing, clean, romantic, unforgettable, convenient, yet peaceful, had Everything we needed and then some. Just what we needed. Can't wait to do it again!!!! Loved the jacuzzi, the bed was pretty hard and we would have liked more pillows to choose from (hard or soft). Overall it was a nice cabin and we had a great stay in the Smokies! My stay was very welcoming and hospitable. The cabin was ready early so I got a head start on a very relaxing weekend. The bed was so comfortable and I felt like I was at home! We was very pleased with the service and the cabin. It's a great experience to stay in a cabin. We've been coming to the Smokey Mountains for vacation about 30+ year's and have never stayed in a cabin. We loved it,that's the way to experience the Mountain feel. Everything was wonderful and convenient. We will definitely go through Aunt Bugs again! Our stay was AMAZING! We had never been to the area before and now is it will be on a list of places to getaway. The cabin was nice and we had a great time. There were no folding chairs in the closet as described and there were some things that were damaged. We were not able to report them because you were closed after 9pm Christmas Eve and all day Christmas Day but we did take pics if tou are interested. None of the damaged items affected our stay though and overall it was a great vacation and we loved the cabin. Everything was great. We enjoyed it very much. The cabin was just like advertised. Enjoyed our stay and will return, and have recommended you to friends and family. We enjoyed our visit and will come back. The cabin was clean except it needed to be vacuumed under the sofa and bed. There were also cobwebs on the base of the tv stand. Cabin was clean and close to the strip. Everything we needed was provided in the cabin. Easy to reserve, check in and check out process. Staff at the office have excellent customer service skills. Reservations was a breeze, upon check in the staff was so nice and helpful. The Cabin was clean comfortable and just what the Dr. ordered. Hi, Our experience at the 1404 Hidden Romance cabin, and booking through Aunt Bug's was awesome. We saw the cabin on their website, and though there was sufficient information on the website to book, we wanted to talk to someone with all of the scams and such nowadays. I called, and the person who was assisted, was great. She was not pushy, answered any questions we had, and it was awesome that they are local, and not a call center somewhere, as they can give real advise. The Cabin was all Pros for us, and only one Con, in that we were unable to use the outside Hot Tub much, because of bees that were circuling the balcony. 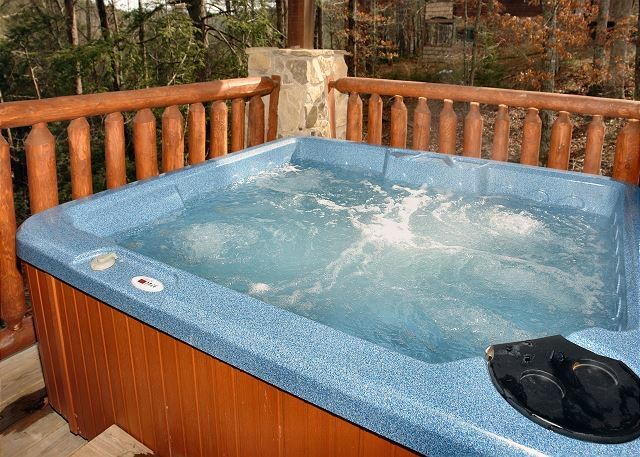 However, the inside Hot Tub was of course available since this cabin has both. It was clean, and had all of the features you needed. Please keep up the great work, and take no short cuts. We will hopefully do more business with Aunt Bug's and maybe even stay at this exact cabin again. We liked it that much. Everything went well. Cabin was clean. Emails was nice. Just wished it didn't rain. When we arrived, the hot tub was malfunctioning. You had it fixed that night. The cabin was so clean and cozy. My family had a great time. The cabin was spotless and beautifully furnished. We felt at home. very happy with the service at Aunt Bug's - but this particular cabin "Hidden Romance" could use a few things done to it - the front door lock does not function properly, looks like it has been broken into at some point - there is no broom and we were tired of stepping on blacktop gravel, that was being drug in, in our bare feet - the hot tub could use a privacy wall (lattice or something). We truly enjoyed the whole experience the cabin was nice the view was beautful overall we enjoyed it . planning on comimg again end august.